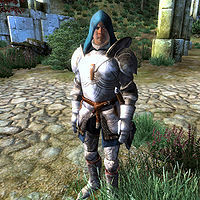 Iver, a Nord battlemage, is an Evoker of the Mages Guild. He is part of a contingent of Battlemages sent to ambush Falcar once he surfaces from the ruins of Silorn. He only appears during the related quest. Once the related quest is active, he will be found outside Silorn, patiently waiting for your arrival. After you have talked to Thalfin, he will make his way towards her and will then loiter around until you have assigned him to a particular placing. After you have given out your orders, he will dutifully carry them out and head to one of the two locations. He wears steel boots, cuirass, gauntlets and greaves with a mage's hood. His only other possession is a meager amount of gold. In combat he relies on a steel war axe and a special set of spells: three Destruction, one Alteration, one Mysticism and one Restoration. If you address him before having talked to Thalfin, he will say: "If you're here to help, you'd better talk to Thalfin." After your conversation with Thalfin, Iver will respond: "At your service. What do you need?" When asked about his preferred combat abilities, he will tell you: "I can manage with a weapon or with spells, but I've really been working on healing lately. I'm getting pretty good at it." He will then let you decide where he should be positioned: "Where should I wait? Up close, or farther back? I'll try to help whomever I'm near." If you are not yet ready to position him he will say: "I'll wait here then. Let me know when you've made up your mind." If you order him to position himself in the background, the disappointed healer will say: "Okay, but that puts me farther away from the group." If you put him up close, he will be happier: "You've got it. I'll do my best to keep everyone healed." Regardless of your choice, Iver will rush to his spot and be set for battle: "I'm as ready as I'm going to be." If Iver survives the ambush, he will remain at Silorn indefinitely. This issue has been addressed by version 2.2.0 of the Unofficial Oblivion Patch; he will be removed from the game when the quest is completed.